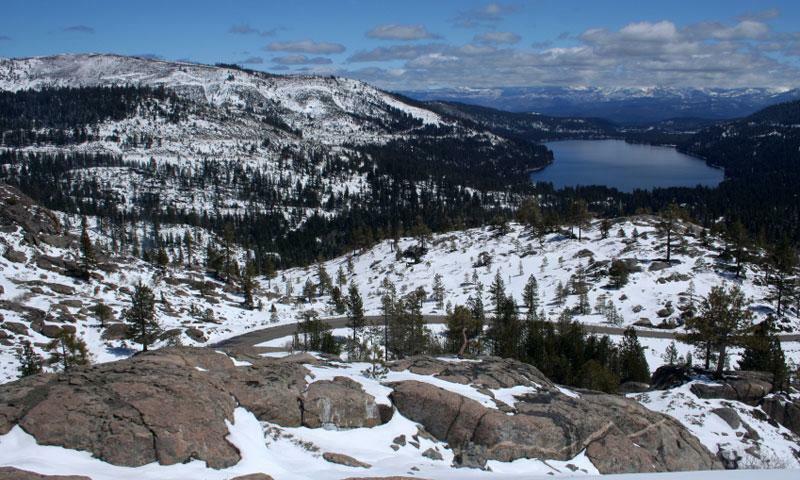 Donner Pass, a high mountain pass near Lake Tahoe, is a scenic drive not to be missed when visiting the area, with many sights and activities for the whole family. Donner Pass California is likely the most famous mountain pass in the United States, at an elevation of 7,085 feet with easy approaches from both directions. Along Interstate 80 in the Sierra Nevada Mountains, this is a most beautiful drive, easily accessed from Lake Tahoe. Donner Pass Highway (actually Interstate 80) can be reached from Lake Tahoe by leaving South Lake Tahoe on California Highway 89, and going west on Interstate 80. You will cross Donner Pass about 9 miles west of Truckee. From South Lake Tahoe, Donner Pass is about 50 miles and takes about an hour and a half to reach. This is one hiking trail that can’t be beat! You can reach it by taking the exit which is west of the Donner Summit Rest Area. The Summit Lake Trail is an easy 2-mile trail, crossing two creeks, passing through a meadow and up to Summit Lake where you can fish or camp. From the same exit from I-80, you will also find the Warren Lake Trail, a more difficult 7-mile hike through fir and lodgepole pine forest. At the lake you’ll find the ideal place to camp off the beaten path. A great place to come for a wide variety of activities! Here you can swim, water ski, sail, or fish. You can catch rainbow and brown trout. You may also find Mackinaw and Kokanee salmon. Within the Memorial Park you can picnic, camp and fish. And be sure to visit the Emigrant Trail Museum and the Pioneer Monument, which commemorates those who immigrated to California in the mid-1800s. Donner Lake is less than a half hour from a number of famous ski resorts, including Boreal, Squaw Valley and Sugar Bowl. The Donner Pass area has more than 415 inches of snow each year, so winter activities are the best. Save Donner Summit is a political action group striving to save the ecosystem and natural resources around Donner Summit.